Our Private Teacher Training offers its participants the convenience of starting when YOU are ready. This program is a combination of One of One Lead Syllabus (Curriculum) via webcam & Group Practicum (Class Practice Participation) at the studio location. The class practice portion can be done around your schedule of availability. In the Private Teacher Training Program, sessions are typically scheduled once a week for 2 hours each session. The program runs 36 weeks. Private Teacher Training has been carefully designed to maximize learning potential and program retention. We find that most people learn more effectively by having weekly shorter classes, rather than long extended hours of training throughout an entire weekend, week, month or more, which can be overwhelming based on the amount of materials required to complete a quality training program. This also allows us to give you the attention and skills you need to progress at the pace that is right for you. Once all required curriculum hours have been fulfilled, you will be given 30 days to complete a final written exam, to perform a live teaching demonstration, and to lead 5 group-setting yoga classes to be eligible for certification. 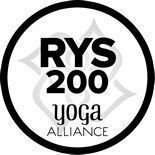 Note: Our Private 200 RYT Program follows the same frame work as our Group 200 RYT Teacher Training Programs. Fundamentals of Teaching Yoga is a must do for anyone who is a serious practitioner and wants to deepen their understanding of yoga or someone who aspires to become a yoga instructor. Each class topic will feature and discuss learning objectives that once achieved, can be applied to your teaching skills and/or yoga exercise practice. The most important thing you can achieve from this course is knowledge. However, upon successful completion of this 200 hour Yoga Alliance registered and approved training course, you will receive a certificate and head into the world confident and ready to teach a grounded, safe, and inspired yoga class. This certificate can also be applied as a training credential and/or essential prerequisite course to any further teacher training program, should you go on to pursue a 500 hour certification. We are proud to say that our teacher training programs are accredited and registered by the Yoga Alliance, the organization responsible for maintaining the integrity and consistency of yoga teacher training's throughout the world. Yoga Alliance only accepts and registers a school when its yoga teacher training program meets clear, and predetermined criteria, such as ours.